The dashboard of Brightedge is completely flexible and allows different reports to business functions e.g. executive report vs. SEO analyst report. Events tracking shows specific events, that have been implemented to a project. Competitor analysis and history data. Another nice feature is dashoard scheduling in a report. This allows quick email reporting to clients or internal stakeholders. The keyword tab also shows some powerful data: Page 1-3 Stacked report, average keyword rank, Keywords Rank page 1 & 2, Universal Search Results, Liks & Shares and Rank Report, Tweets and Rank report, Twitter Keyword Volume report, +1 and Rank report. What is also interesting is the keyword group reporting where you can track history of the group and compare for example this week vs. last week. On top filtering is easily possible. It seems that the backlinks tracking is mostly powered by Majestic SEO and Google. Nothing specific to mention here. Top 25 keywords to focus on, Social strategies, onpage strategies and offpage linking recommendations. Also great is the capability to assign these tasks to people within the system. This is a page manager, which helps where the onpage opportunities are. Again here the top 25 searches to focus on, which shows you pages, which have the best opportunity to gain traffic. Great feature is also the keyword prioritizer. 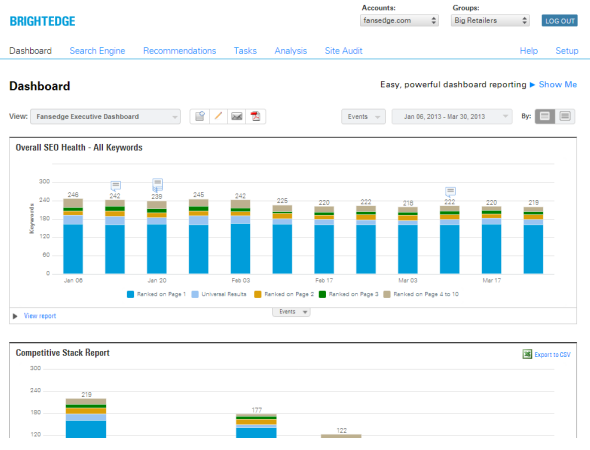 This allows a user to prioritize the keywords to focus on. 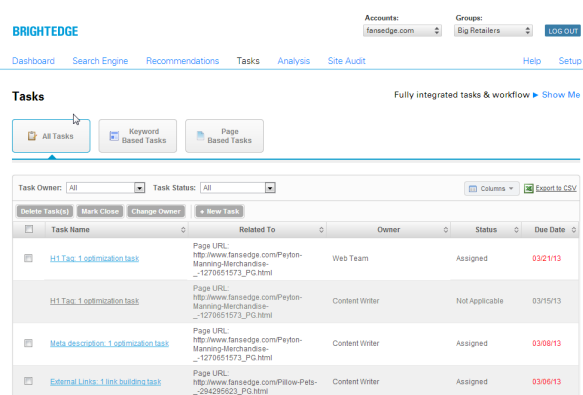 Again here the page manager allows to assign tasks to different stakeholders. Also recommendations can be compared to the top 10 results in Google, meaning if your Title tag is off you can get some ideas from the top pages ranking for that term. The linkbuilding recommendations looked also like a good idea, but not sure if it is worth the effort to use a tool, which bases BL on third party vendors. Compare your social signals to top 10 ranks is also an amazing feature. Comparing the likes on a specific page of your project vs. the median of the top 10 ranking pages seems to be a great idea and we really like the feature since it its something no other SEO platform has been focusing on. What’s also great is that the user of Brightedge can assign social signals tasks to the social team of a company and then produce direct results. 8. The facebook fan page setup is also very slick and allows a full analysis of FB fan page stuff. Personally I think this is the killer feature of Brightedge. It allows the user to assign tasks per keyword, group of keywords, per page or entire site. Collaboration is something no other enterprise solution takes care of. Especially not in a smart way. This part looked like SEMRUSH data of organic rankings per domain, but I haven’t verified it. Even if it is third party data this is pretty interesting since this allows users to add keywords to their tracking and analysis it right in the system. Overall I prefer having a good tool integrating good data from other vendors than wasting time building everything in house (same for backlinks data!). Top organic pages of competitors is another great idea, which is nice. This way you can piggyback on your competitors success by also going after their backlinks or just copying their onpage strategy. 11. The SEO X-ray competitive analysis pretty much gives you some visibility scoring for your domain. Definitely interesting approach, but hard to read in my case. To summarize it I’ve got a completely different opinion about Brightedge than I had before. It’s a powerful tool with a lot of collaboration tools plugged in. Waht always bothered me with most tools is the fact that they are used solely for reporting purposes and less for actually getting the job done. With my first testing projects this has changed and I see their unique approach in the enterprise space very refreshing. I also give them the kudos for integrating third party vendords data rather than re-inventing the wheel in a bad way.